Avoid Car Insurance Mistakes Before It’s Too Late. Most people buy auto insurance without truly understanding their insurance policy and only re-evaluate after they’ve had an accident. That’s too late. The time to re-evaluate your car insurance coverage is now before an accident occurs. Often times people don’t question their car insurance coverage because they just don’t understand their policy. Knowing this, we have broken down a Declarations Page to provide you with some valuable insight to help you understand your coverage and make informed decisions about how much coverage to buy so you feel like you’re truly protected. 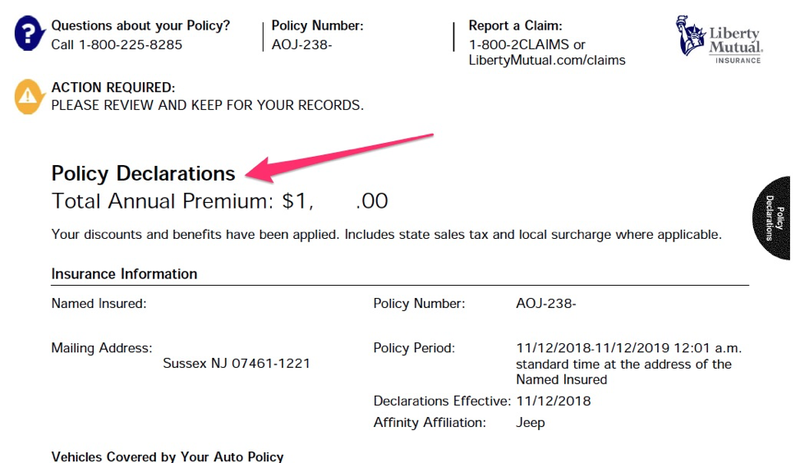 Your Declaration Page is the page(s) in your car insurance policy that tells you how much coverage you actually bought. Most Declaration pages are located in the first few pages of your policy and should have “Declaration” written somewhere near the top. Why is it so important to understand your auto insurance coverage? Because you can’t evaluate whether you bought enough coverage to protect yourself and your family unless you know what’s being covered, and how much coverage you have. We have broken down coverage information so you know what the numbers mean. Each policy is different (so your policy will very likely vary) but this sample policy will help us explain how you can interpret your policy. The first part we will look at is the liability insurance coverage, which is “part A. Liability,” in the sample Declaration Page below. Liability insurance coverage is legally required in most states and pays for damaged property, or physical injuries of other drivers and passengers if you’re found at fault in an accident. In other words, it covers people and property that you may hurt or damage in an accident that’s your fault. In this sample policy, notice that there are liability limits for bodily injury, and for property damage. The first thing you’ll probably notice is that for the bodily injury limits, highlighted below by the red arrows, there are two numbers. The first is $100,000.00 and the second number is $300,000.00. Not all policies have two numbers, but when they do, the first number, $100,000.00, is the amount available per person. This means if you injured someone while driving and that person was alone in their car, the most your insurance company will pay to that person is $100,000.00. They will NOT pay $300,000.00 unless multiple people were injured in that accident. Take the same scenario and assume an entire family is riding in the car you just hit, and 4 out of 5 people are injured. Your insurance company will pay up to $300,000.00 for the accident. That means that each of those four-injured people will have to share in your $300,000.00 policy limit. Your car insurance company will not pay more than that for this accident. If the damages exceed the coverage amount, you could be responsible for the excessive damages, over $300,000.00. 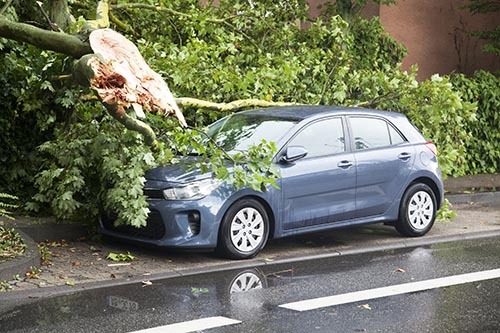 Property damage liability coverage pays for the cost to repair the damage you cause to the vehicle or property owned by someone else. This liability coverage does not protect your own vehicle. 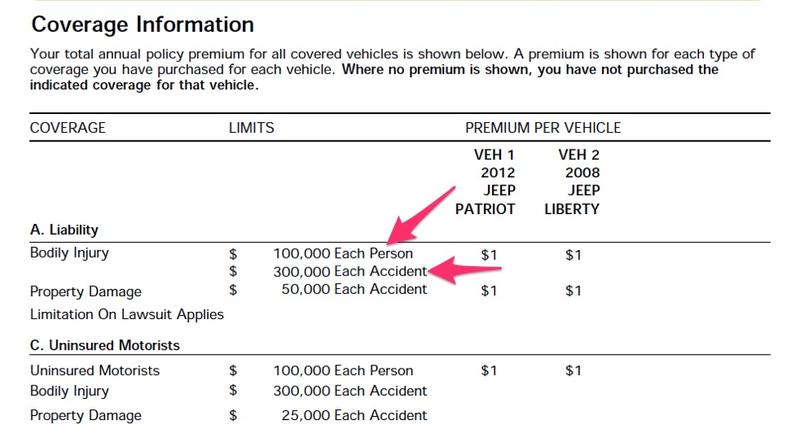 Again using this sample policy as an example, this policy would cover $50,000 for each accident. If the damages exceed the coverage amount, you could be responsible for the excessive damages over $50,000.00. Now that we’ve covered the liability coverage that covers your liability if you injure someone else, it’s time to look at the provision of your auto insurance that covers your claim, if you’re hurt through the fault of another driver. Imagine that you are injured in a hit and run accident, or another driver causes an accident and you are injured, but that driver was driving without insurance, or simply had a low amount of insurance coverage. If you can’t recover money from the driver who hurt you, because that driver is unidentified or uninsured, or underinsured, your insurance company will stand in the shoes of the driver who hurt you, and will cover your claim just like the other driver’s liability insurance would, if they had liability insurance. That component of your auto insurance is known as your uninsured/underinsured motorist coverage. In essence, this is the coverage that allows you to protect yourself from future injuries you might receive at the hands of other drivers, regardless of how much insurance another driver has. This sample policy has the same limits for the uninsured/underinsured bodily injury coverage as it does for the liability coverage. However, the uninsured property damage limit is less than the property damage limit in “Part A. Liability” above. You may opt to buy less uninsured/underinsured coverage than you have in liability coverage, but you cannot purchase more uninsured/underinsured coverage than you can liability coverage. This means that if you want to purchase the maximum amount of uninsured/underinsured motorist coverage you can to protect yourself, you must also purchase the same amount of liability insurance coverage. In other words, you cannot protect yourself more than you can protect others on the road that you may hurt. You may, however, opt to buy less coverage to cover yourself than what you buy to cover others. Underinsured coverage operates the same way but applies if you are injured by another driver who has an insufficient amount of liability coverage. Almost half of the states require at least some form of uninsured or underinsured motorist coverage. Notice here the Limitation on Lawsuit applies on this liability insurance policy. Choosing this type of coverage severely limits your ability to bring a lawsuit for injuries sustained in a New Jersey automobile accident. It operates as a waiver to sue another driver who has injured you, for any non-economic damages associated with that injury. The most common type of non-economic damages is pain and suffering. If this waiver applies to your policy, you may be barred from filing suit for pain and suffering unless your injury is: death, dismemberment, loss of a fetus, significant disfigurement or scarring, a displaced fracture, or a permanent injury to a reasonable degree of medical probability. Even if your injuries fall into one of these categories, the limitation on lawsuit option may make it more difficult to pursue your claim. For example, disputes often arise in litigation as to whether or not an injury meets the necessary criteria to be considered permanent. Although you may save a substantial amount of money on your auto insurance premium by selecting this option, it may make it more difficult to succeed in a lawsuit if you are ever injured and is something you must consider and weigh when purchasing auto insurance. Personal Injury Protection, also known as PIP, pays for your medical bills if you’re injured in a car accident. This type of coverage may also cover ambulance fees, loss of work coverage, rehabilitation services and medication up to the policy’s limit. Personal injury protection covers these types of bills regardless of who was at fault for the accident. PIP is required in most states including NJ, which is a no-fault state. The states dictate the minimum amount of coverage that is required. Although PIP coverage is typically $250,000.00, some auto insurance carriers permit you to purchase significantly less PIP coverage which may not be best for you. It is always important to understand what you are purchasing and auto insurance is no different. Review your auto insurance policy today to make certain you have enough coverage to protect you.